Blackberry Storm review | What Hi-Fi? Blackberry customers are generally concerned more with catching up with their emails than EastEnders. 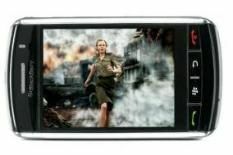 The Storm (a Vodafone exclusive handset), looks to encourage users to do both. The handset looks and feels like a premium device – more than the iPhone 3G. On the back is a 3.2MP camera and a brushed aluminium battery cover. On the front, in the place of BlackBerry's usual QWERTY keypad, is a touch-screen that acts like one big button. This 3G/HSDPA-enabled phone comes with 1GB of built-in memory, and is compatible with MicroSD cards. You don't get any additional storage with the phone as standard. There's no wi-fi functionality either for web-browsing over a home network. It does have A2DP stereo Bluetooth, a 3.5mm headphone jack and the standard headphones are slightly more bearable than those of the Apple iPhone. Video support includes MPEG4 and WMV files while support for audio files includes MP3, AAC+ and WMA. The Storm uses Roxio Media Manager to transfer files. It's easy to use and will automatically convert files to play. The phone can sync with your iTunes and there's an icon that can take you straight to the Vodafone Music Store. The Storm's media player works well. Using the 'clickable' touchscreen isn't quite as intuitive as the iPhone and the accelerometer is a little sluggish, but you can navigate through content at a reasonable pace, sliding and clicking as you go, and the phone can display album artwork alongside the track being played. Sonically, the Storm sounds a little compressed. Detail levels are good and there is decent bass weight. But, the overall presentation lacks expression and dynamics. Michael Jackson's Billie Jean doesn't shine as it should - the bassline lacks crispness and punch. On first impression, video playback is impressive. The picture is bright and punchy, blacks are deep and rich, edge definition is good and the phone handles the action scenes of a Babylon A.D. trailer exceptionally well. However, the Storm doesn't have the iPhone's black detail and the colours are a little overblown compared with some of its competitors. While the Storm isn't the iPhone killer BlackBerry had hoped for, it's still an attractive option for those that want to combine business with pleasure.